Our cat, Buffy, inspecting the Piñon Christmas tree at 5100 Margo Drive. While rummaging through a picture box recently I ran across photos of two trips to Beaver Dam State Park to cut Christmas trees. Denise and I were married on Groundhog Day in 1980, and for three years in a row I traveled to Beaver Dam to cut our Christmas tree. 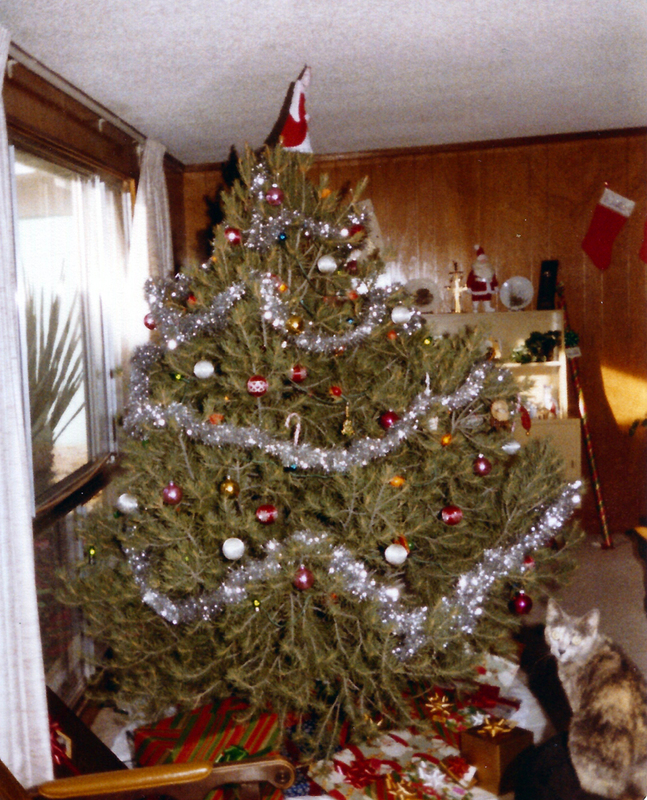 We were renting a small cinder-block house from Uncle Art on the east side of town, and the wide-bodied, pear shaped piñon pine trees really filled up the living room window during Christmas. Those first three years of marriage were turbulent, more so than the usual early marriage adjustments. Our first Christmas in 1980 came right on the heels of losing our daughter a mere twenty-four hours after her full-term birth. I won’t go into the details of those troubling first years, but I will say that the past thirty-three years (I’m writing this blog in January 2013) have deadened the pain and the Lord has blessed us with five grown boys and a brand new daughter. In what are supposed to be the "honeymoon years" I was aware that Denise and I were dealing with the grief of loss much differently. We were in our mid-twenties with minimal life experience and our whole adulthood ahead of us. My grief was more for my wife’s loss. From my perspective Melissa was in heaven and we would see her again and that was sufficient for me. And although I understood Denise's grief had to be different for no other reason than she carried our daughter inside her for nine-plus months, I still exhibited youthful impatience with what I felt was protracted grief on her part. 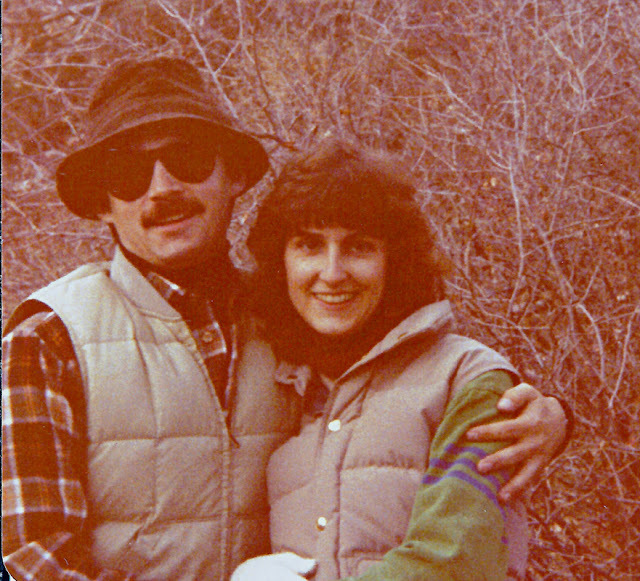 I suppose in those early years of marriage I used my fishing trips as a salve for my own pain, not so much from losing Melissa but more from being unable to fix what I thought was broken in my wife’s life. Thanks goes to God for both of our perseverance through those early years of marriage. Verity, Shawntel, and Denise enjoying the warm December sun at the Wilderness Camp. I rationalized to those who might listen that my Christmas tree cutting was all about "free" Christmas trees. Well, not exactly free as there was the $5 per tree permit charged by the Bureau of Land Management (BLM). Then there was the cost of gasoline, which back then was about a $1.30/gal. (gas prices doubled from $0.60 to a $1.20 within two years after graduating from college thanks to the Iranian Revolution that led to the 1979 oil crisis). In constant dollars the $1.30 is about $2.60 today. Let's assume my little Toyota 4x4 pickup truck achieved twenty miles per gallon, so in today’s dollars the round trip fuel cost was about $47. Not that great of a deal. The Vincents and Tibertis enjoying the post-tree picnic celebration. FisherDad working the Wilderness Camp section of Beaver Dam Creek. 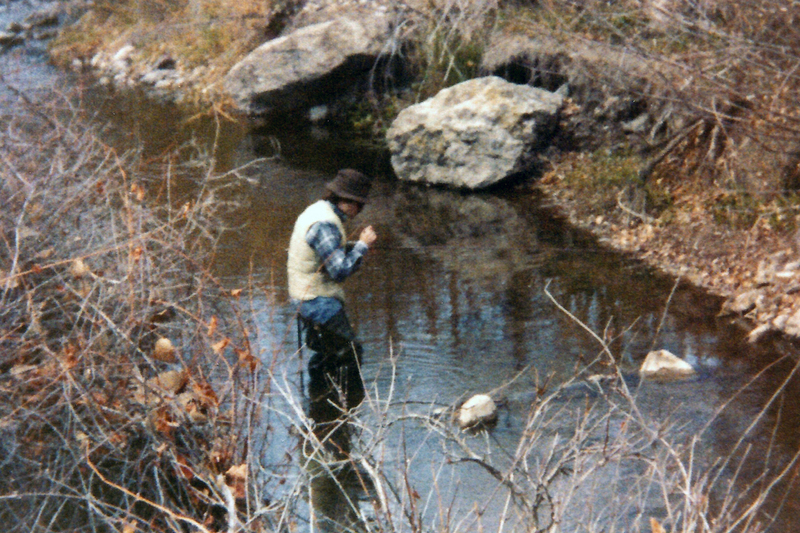 FisherDad casting a fly against the right-side boulders. Our oldest son, Nick, was born in the summer of 1982. When the winter of 1982 rolled around there was no one who was willing or able to accompany me on that year's tree cutting trip. That was alright with me because I projected more time to fish without the family picnic. 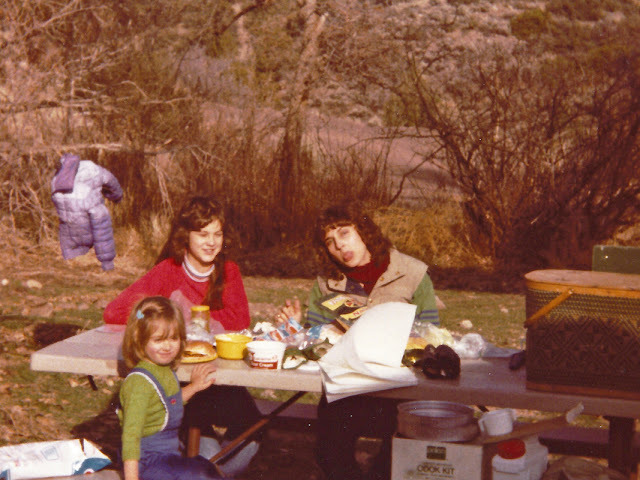 I'm sure I fantasized that December 1982 would be the fishing trip I always hoped it could be. I had tree orders from my mom, Estelle, and my boss, Jim. My plan was to leave early, cut the trees quickly, and then head to the creek for a few hours of fishing. 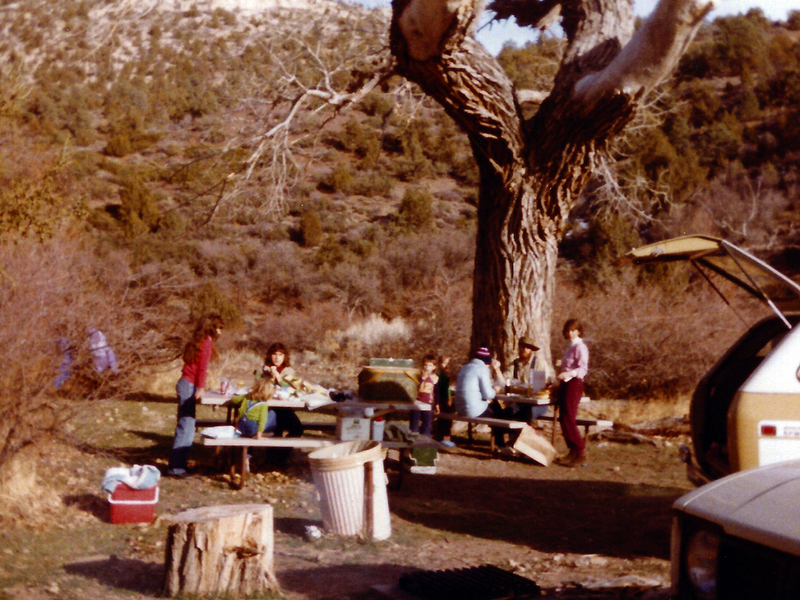 The Internet didn't exist then, and weather forecasts rarely reported on obscure cities like Caliente and Panaca, both of which served as gateways into the state park. Driving north on U.S. 93 from Pahranagat to Caliente I noted a light snow sticking to the desert floor. A storm had passed through the night before, but the sun was shining on the highway causing the snow on the asphalt to quickly melt. I certainly I noticed the bank of clouds to the east, but I had not connected the dots that without bright sunlight on the 30-mile dirt road that headed east into the state park it was quite possible that conditions would be very slippery. I must have thought enough about it that I let some air out of my tires when I pulled off the pavement onto the snow-packed gravel road. I had read instructional books about four-wheeling that suggested reducing air pressure in your tires could help improve traction under certain conditions, and I must have assessed the situation enough to determine this was one of them. I believe I dropped the pressure down closer to twenty pounds than I should have. at home in New England or Europe than on a stream in the Great Basin of Nevada. Even today at age fifty-six, I can be impatient to reach my destination to start fishing. Imagine what that might have been like for me at age twenty-six. It's not good to combine impatience with snow. I had driven my truck on snow before, but never before on the Beaver Dam road. When that road is dry it is easy to reach speeds approaching 65 mph on the straightaways, and so I thought I was doing good to keep my speed to around 30 mph (and after all, I had manly four-wheel drive). I also assumed, incorrectly, that the snowy white blanket covering the road was slushy because it had melted so quickly on the highway. Being under the eastern cloud bank it was not slushy, but rather firmly packed and slick. As I reached a section of the road that I knew would gently angle to the left, I failed to take into account all the physics involved in the situation. You see there was a slight rise, sort of a little hill, that preceded the gentle turn. As I traveled over that hill at 35 mph the “lift” off the hill was enough to break loose the tenuous traction my rear end was maintaining. Having already eased the front wheels into the left-hand bend my whole rear end began to slide around to the right side of the road. As usually happens in these sort of crisis situations, your mind slows everything down so what took three seconds to actually occur appeared more like thirty seconds. It was one frighteningly surreal slow motion accident. As the truck continued its 180 degree pirouette on the snow, the momentum of the rear end swinging around slid the truck into the left hand berm of the road. Obviously, the physics of the rear end swinging around in a counter-clockwise motion was stronger than the vector the tuck was heading at the top of the little rise in the road; by all accounts I would have thought I would end up in the ditch on the right side. Two other interesting things happened once the truck side-swiped the left side berm (remember that at the point of impact I was facing backwards after spinning around 180 degrees). One was that the truck gently tipped onto its passenger side, so gently that nothing broke. The passenger side door and quarter panels got dented and the passenger door mirror collapsed, but there was no broken glass. Once everything stopped moving, there I was still sitting in the driver’s seat, held up in the air by the seat belt and parallel to the ground, looking back towards the little hill with all the piñon and juniper trees growing sideways from right to left. The other interesting physics lesson was that low pressure tires do not hold the bead very well when slammed up against a berm. I didn’t discover that one until after I unfastened the seat belt and climbed out the window. 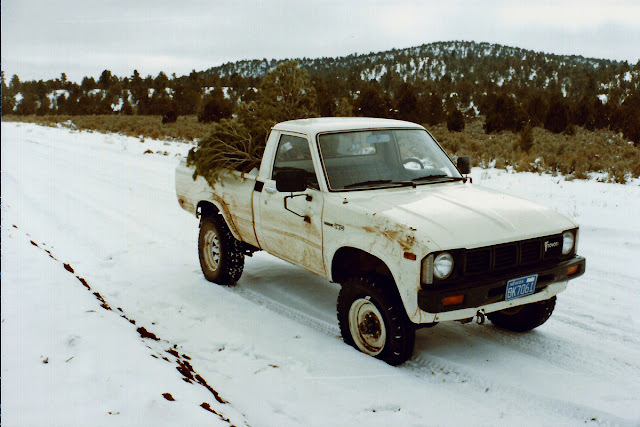 Luckily another Christmas tree hunter happened by, and using my tow rope we were able to pull my truck back onto all fours. Glad to be alive and that the truck wasn’t too badly damaged, I set upon the task of changing the right front tire with the spare. That’s when I learned my next lesson: always check the air pressure of your spare tire when traveling in the back country (good advice before trips of all kind). I didn’t get more than a couple hundred feet when the under inflated spare tire came off its bead as well. 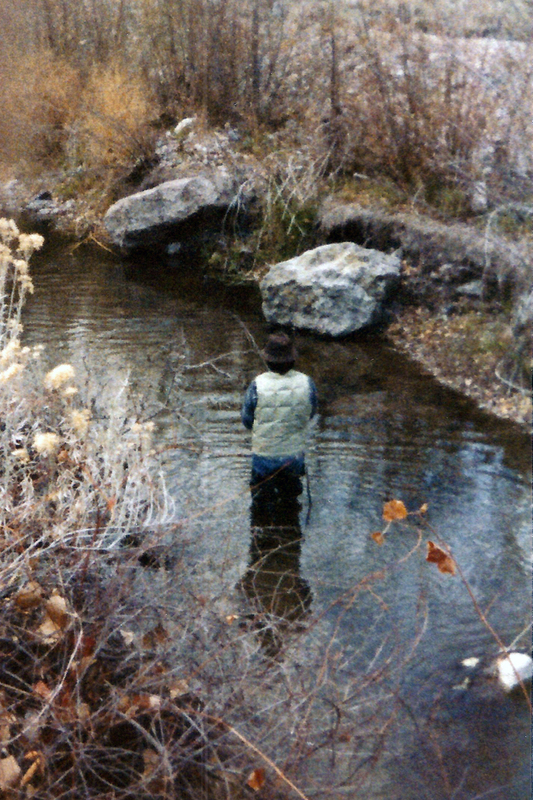 That was when I knew for certain that I was not going to fish Beaver Dam Creek that day. Undaunted, I hiked into the woods, cut the three trees as I promised, dragged each back to the truck and hoisted them into the bed, and then waited for another friendly tree hunter to pass by. I didn’t have to wain too long. I was able to put my original tire in the back of a friendly family truck and hitch a ride back into Caliente. Once there I was able to get the tire remounted at the gas station for $5, but getting someone to drive me back to my truck took $50 (at twenty to 25 mph that amounted to a two-hour round trip for the gas station attendant). A few hours before sunset I was dropped off at my truck whereupon I changed my second tire of the day, in the snow. As soon as I made my way back into Caliente I stopped at the gas station and inflated all my tires to their proper level, including the spare. My post-accident Toyota with its flat right/front spare tire. It cost about $1,000 to repair the dents in the truck, although my deductible was probably around $250 at the time. So, net out of pocket the final tally was about $102 for each tree. Needless to say, that was my last Christmas tree cutting adventure. The youthful married couple braving the cold to harvest Christmas trees. So, what lessons did I learn from all this? Well, it’s best not to avoid discussing family issues by running off on trips; resolving them through open and loving communication is best (and if I go fishing afterwords there’ll be much less guilt involved). 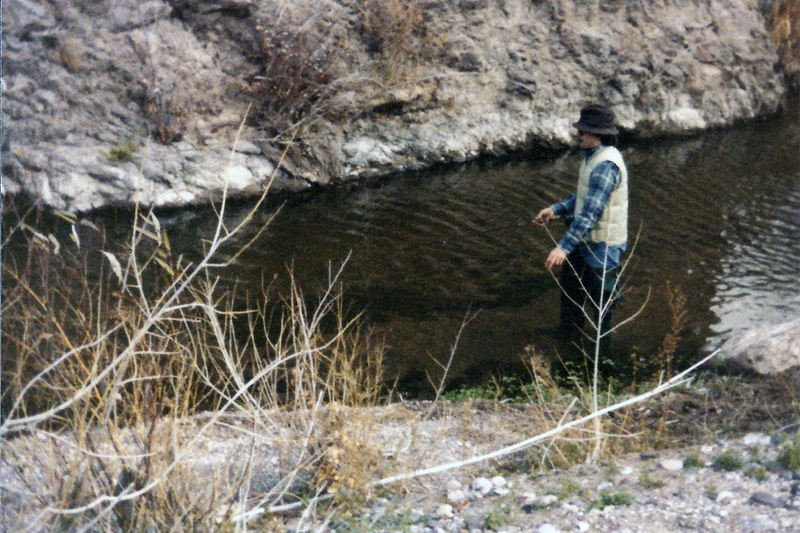 Second, it’s not always a good idea to combine fishing with other tasks; one will always distract from the other. I also confirmed that snow is slippery; I need to slow down. Finally, looking back on all the events during my first years of marriage, I know that God is good, gracious, and loving. I am thankful to Him that our marriage survived our early tribulations.